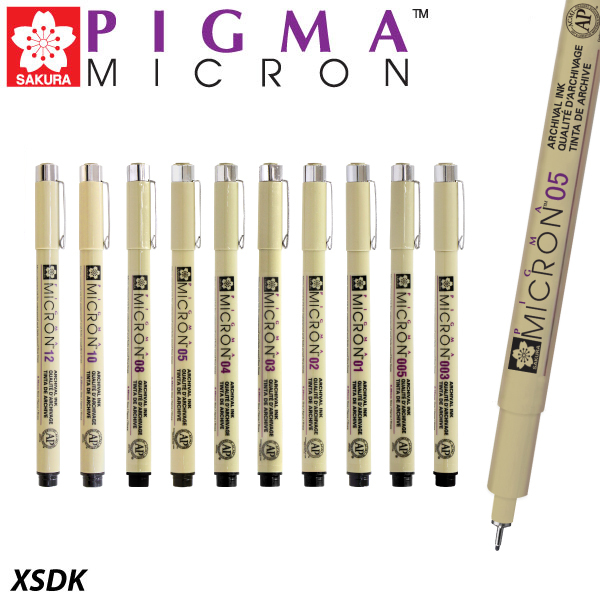 The Pigma Micron is a fine-point pen that utilizes the highest quality archival formula - known as Pigma ink - that is water based pigment ink, water and chemical proof, fade resistant, non-smearing when dry, and does not bleed through most papers.Pigma Pen is ideal for illustration, graphic art & design, archival recording. It is widely used in private institutes and universities through out the world for all types of research and preservation requirments. Available in several tip sizes and colors. - 005 = 0.20 mm. - 01 = 0.25 mm. - 02 = 0.30 mm. - 03 = 0.35 mm. - 04 = 0.40 mm. - 05 = 0.45 mm. - 08 = 0.50 mm.